My annual roundup of the top stories from El Salvador during the last year. Election of Mauricio Funes. On March 15, Salvadorans went to the polls and elected their first president from a left-wing party, Mauricio Funes. The election, 17 years after the end of El Salvador's bloody civil war, was peaceful and fair. 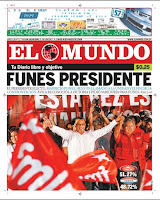 Funes, the former television journalist ran as the candidate of the FMLN, but consciously distanced himself from the hard-liners in that party, even his running mate Salvador Sanchez-Ceren. At the end of the year, Funes continues to enjoy extraordinarily high approval ratings. Divided government produced by National Assembly and municipal elections. The first round of national elections in January 2009 elected deputies to the National Assembly and mayors in every municipality. The mayor's office in San Salvador switched from the FMLN to ARENA as the incumbent FMLN mayor, Violeta Menjivar, was defeated by Norman Quijano. While the FMLN had the most seats in the legislature, it did not garner a majority of the seats, and conservative ARENA and PCN together could form a majority when they work together. In the last months of the year, 12 dissident ARENA deputies split from their party and formed a faction called "GANA" throwing additional complexity into the political divisions in the government. Surge in murder rate. Violent crime surged dramatically in the past year in El Salvador. 2009 concluded with a tally of 4,365 murders, compared to 3,179 in 2008, an increase of 35%. No one seems to have the answers. Without a doubt, the gangs in El Salvador are a significant part of the problem, and it was emblematic of this tragic year when gang members murdered Christian Poveda, a French filmmaker. Poveda's documentary La Vida Loca, portrayed the lives and culture of the gangs. November floods and landslides. A storm associated with Hurricane Ida dropped 14 inches of rain on central El Salvador in 24 hours on November 8. A landslide destroyed the town of Verapaz, and flooding and mudslides killed 200 and destroyed almost 2000 houses. The rains destroyed bean harvests and other crops in many areas, and illustrated again the vulnerability of many of the poorest communities in the country. World economic crisis hits El Salvador hard. El Salvador shared in the world's economic misery this year. Unemployment was up and exports were down. The downturn in the US produced a 9% decrease in the remittances which make up almost a fifth of the El Salvador's economy. Shortly after taking office, Funes announced a half billion dollar recovery plan to try and deal with the impacts of the global crisis on El Salvador. Conflict over gold mining. Gold mining companies Pacific Rim and the Commerce Group filed for arbitration under the DR-CAFTA treaty, alleging the government had illegally deprived them of their economic interest in mining concessions. The Salvadoran government, however, showed no signs of permitting gold mining in the country. Violence and threats were directed at opponents of mining, and three activists were murdered including two in the last ten days of the year. Government sends army into streets to fight crime. President Funes sent an additional 2500 troops into the streets in the most crime-ridden neighborhoods, and gave them increased powers to participate in the fight against violent crime. The move was politically popular, but significant cautions were raised by those who remembered the role of the armed forces in the repression of the 1970s and 1980s. Reopening of proceedings on crimes of the civil war. The year 2009 saw new judicial proceedings aimed at senior officials responsible for some of the most emblematic human rights crimes of the civil war. A court in Spain agreed to hear a proceeding against the top military officers responsible for the Jesuit murders in 1989, and the government formally apologized for the crime. The new government of Mauricio Funes announced with it would comply with a decree of the InterAmerican Commission on Human rights and open proceedings into the 1980 assassination of archbishop Oscar Romero. Good US relations under Obama/Funes. Relations between the US and El Salvador continued to be strong, despite the election of a left wing president. The US congratulated Funes immediately on the night of his election, and US Secretary of State Hillary Clinton attended Funes' inauguration wearing a red dress. But unlike president Funes, the FMLN has not cooled its rhetoric about the "empire" to the north. Corruption. Cases of corruption continued to come to light in 2009. When the digital periodical El Faro published an audio tape showing Roberto Silva and ARENA party official Alfredo Tórrez discussing a bribe, it cost Torrez his position in the party and likely prevented the Attorney General from having another term in office. Torrez later died in what was ruled a suicide. Former president Saca was revealed to have diverted government funds for the presidential publicity budget, and president Funes announced investigations into padded payrolls at government ministries. I admit, there's a lot of bad news in those top stories. But for 2010, let's remember that travel publisher Lonely Planet picked El Salvador as one of the top 10 countries in the world to visit this year. The local Newspapers are far far worse, you, Tim are part of the "media" and you have to report as you see it, no sugar coating,** but for many of us, rough edgs and all El Salvador is a great place to live, work or visit and the people in general are just friendly and hospitable, as a resident I have many friends for LIFE, friends, not just "friendly" people!!!! **Wht I despise about many of the Costa Rica travel and real estate sites (mostly US citizen resident webmasters, face it, as my Uncle, who was an Ex Pat resident himself, native of Poland, told me in Guatemala in 1985, the gringo is brought up to SELL), great PR, sugarcoating, no reality, just an Internet con.